The summer sun in Statesboro, Ga is heating up but, the summer parties are still under way. Don’t be pushed indoors from the heat, just add WATER! An inflatable water slide rental from Leap Joy Inflatables is the perfect addition to your summer party or event. Your guests will be excited and refreshed playing on one of our giant water slides. Check out our 21ft Wild Rapids Slide! This huge and fun slide looks like a wild rapid ride. The slide has a “wave” right in the middle to add to the fun. Our double lane slip and slide is a wild ride that is twice the fun with the double lanes! Everyone loves slip and slides and with the inflatable bottom, there’s no chance of anyone hitting the ground. If you’re needing a larger slide, then our white water slide is the way to go! The white water slide is a 20ft wave slide with a 3ft deep waiting pool at the end. 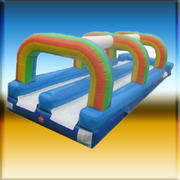 Leap Joy Inflatables loves serving Statesboro, Ga with high quality inflatables that kids and adults go crazy for. We also offer free delivery within 20 miles of Statesboro! Delivery outside of this area is subject to a fee. Leap Joy offers a "pick up and save" option as well. Contact us today!